Multiplex 16-channel 2.4 GHz receiver in demo rig. More details below. I'm not usually one to linger on a flat field (unless flying a discus launch glider), but the MPX fly-in at Baldock was too tempting, with the chance to meet the guys from the Multiplex factory in Germany, and see their new 2.4 GHz offerings, as well as doing a bit of informal fun flying. The day turned out gloriously sunny, and flying conditions were perfect with a well organised flight line. Challenges included limbo, balloon bursting and streamer chasing, and prizes were awarded to the winners. A barbecue was also laid on for the hungry pilots. 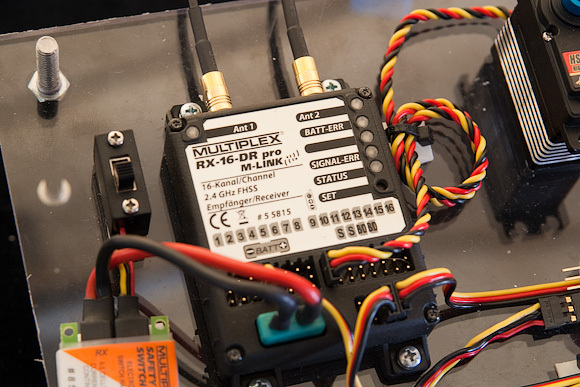 Multiplex had a large tent with some interesting goodies on show, including the Royal Pro M-LINK 2.4 GHz, as well as 2.4 GHz module/Rx kits for the 3030/4000, and a pre-production 2.4 GHz Cockpit SX. There was also an impressive demo of their much heralded downlink facility. Sensors attached to the airborne components monitored motor RPM, battery voltage, motor temperature, mAh used, and current. Data from the sensors was transmitted back to the transmitter and displayed on the LCD. Very impressive stuff. And yes, I know this kind of thing is already available from the likes of Jeti, but its integration in the Royal Pro transmitter firmware is very cool. The sensors will be available a little later in the year. Note that the 'Light' versions of the receivers (as bundled in some M-LINK conversion kits) do not support telemetry. Also, the 3030/4000 Tx modules are more limited, in that they only support a single sensor, with an audible indicator only (i.e. no screen readout). As for me, I got some relaxing flying in with my Easy Glider and Cockpit SX. More importantly, I took home an M-LINK 2.4 GHz conversion kit for the Royal Pro. This will be used to convert the 35 MHz transmitter which I have on loan (it was reviewed in RCMW a few months back). A 2.4 GHz conversion kit for the 3030/4000 is promised soon, again on loan for review in RCMW.